May's Princess of the Month from Mommy Made This is "Sleeping Princess." You can get it at Scraps N Pieces HERE. There are also coordinating templates from Memories by Digital Design. Get them HERE. 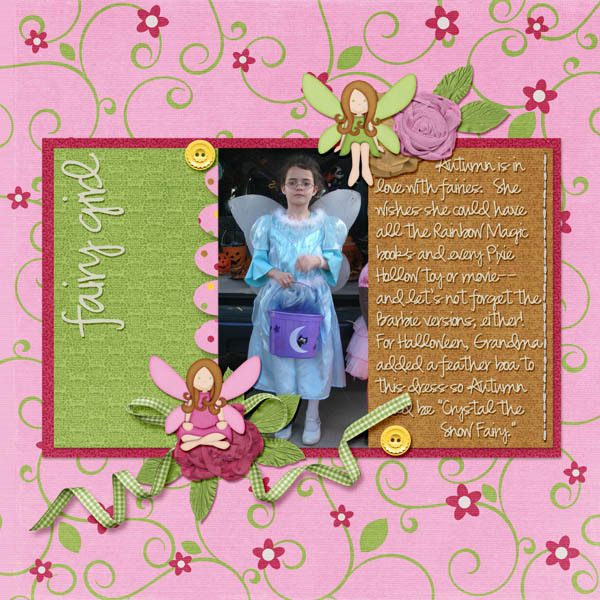 I adapted one of the templates to do this page of my daughter's "Crystal the Snow Fairy" costume at Halloween. I also saved the cluster just for you! You can download it HERE. So, here's my part of the team kit. Our Theme was "It's a Girl Thing." At first, we all thought of chocolate and treats when we saw the rich brown color in the palette, but nobody seems to have gone that way with their designs. I hope you like it and can find something you want to use. Or see the full class gallery HERE.